Strip-o–gram Amy! As the range of Doctor Who action figures steadily grows – incorporating both Classic and Contemporary series’ – the figures get more detailed and impressive. This collection ties in with the final two-parter from 2010’s Fifth series of new Doctor Who and each pack contains one figure plus an MP3 CD. (It is worth mentioning that the disc will only play on a computer, not a DVD or CD player).Even better, the CDs (and their cases) fit together to create your very own Pandorica – clever/cynical marketing but also a fan’s dream!My Six year old is collecting the figures, and while not cheap they are certainly good value for money. 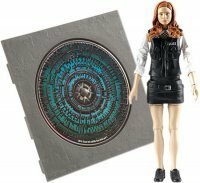 This figure sees latest travelling companion Amy Pond (complete with cheeky police uniform) in all her feisty glory; the clothing detail is exquisite and there are plenty of moveable joints too – hours of fun is there to be had!